Product #46705 | SKU LP37090 | 0.0 (no ratings yet) Thanks for your rating! 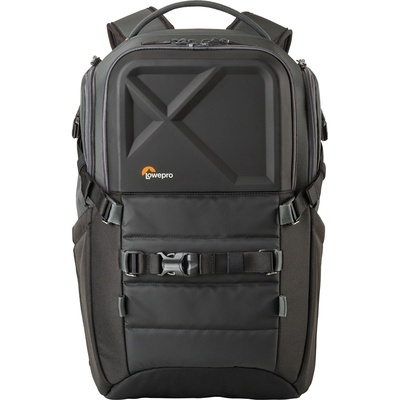 The QuadGuard BP X3 Backpack from Lowepro features a custom interior designed specifically to hold an FPV quad with up to 5" props attached, as well as several accessories. On the exterior of the pack, additional mounting locations allow you to attach up to an additional 3 drones. The pack's FormShell design provides an armoured exterior shell to help protect your equipment and patented, built-in All Weather AW Cover protects your gear from rain, dust, and sand. In addition to the quadcopter, this backpack's interior will accommodate the transmitter (radio controller), up to 20 flight batteries, a 15-inch laptop, as well as several other cables, spare parts, and accessories. The QuadGuard BP X3 Backpack also features stretch and zipper side pockets that provide quick access to water bottles and other small items, as well a removable toolbox that grants easy access to tools for quick repairs. Other essentials, such as sunglasses, flashlight, light jacket, keys, etc.